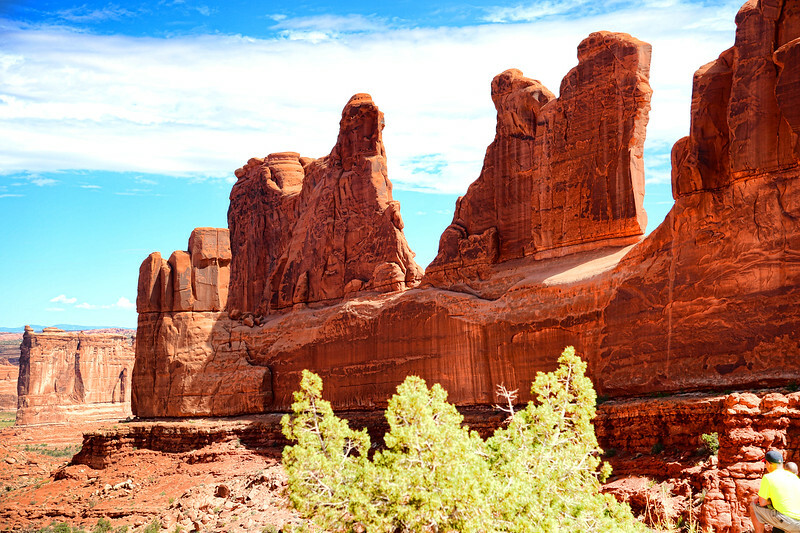 This is the other side of the entryway (actually, the first stop after entering) into Arches National park. And, it is the other side of the vast rock canyon full of structures from the photo I posted yesterday. These giants are a bit in shadow from their counterparts across the way. I am standing on an elevated area so by looking at the canyon floor, and comparing the size of the man and little boy in the bottom right corner, you can see how enormous these rock structures are. I thought the one structure that is third from the right side of the photo looked somewhat like a camel. What do you think? Hi Linda, this is Beautiful. was just here.. love that place! Agree, it does look like a kneeing camel!